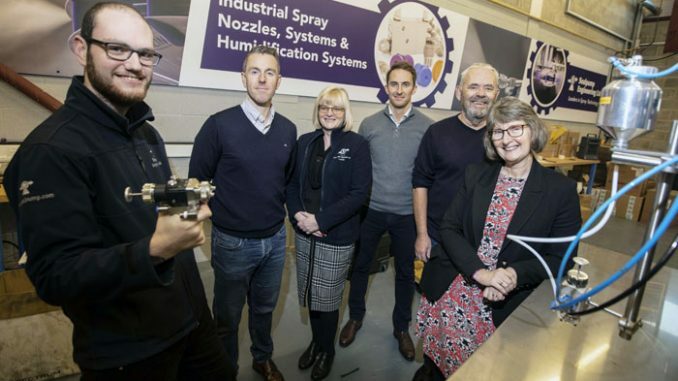 A Redcar company heading for a £2m turnover as one of the UK’s leading designers of industrial spray systems has doubled the size of its premises and is boosting its apprenticeship plans. Sealpump Engineering was the first tenant to move into UK Steel Enterprise’s Innovation Centre at Redcar when it opened in 2000. The company has steadily taken on additional workshop and office space since then and this latest move, into one of the centre’s largest workshops, means it can invest further in testing facilities and grow its team of six designers and sales engineers. Sealpump, run by Stuart Brown and Stephen Larkin, was set up by the late Tony Larkin and now has nearly four decades of technical expertise and experience. It designs and supplies industrial spray systems that do everything from coating food products and cooling steel to collecting gases and cleaning conveyor belts. The company also supplies systems that control dust, odour and humidity and has a growing number of customers from around the world including India, the USA, China, Poland, Canada and Chile operating in the food, pharmaceutical, electronics, steel, chemicals, mining and automotive sectors. Its unique methods and systems are used in the production of pet food, frozen pizzas, in car plants and by printers and fabric manufacturers, providing increased productivity and energy efficiency, reduction in costs and help to meet stringent environmental standards. Taking part in a major food exhibition in the USA recently resulted in immediate interest and sales and Sealpump was also appointed as UK agents for Merlin, an Austrian manufacturer with products that complement their own range. “We upgraded our spray testing facilities in 2015 and now this new workshop enables us to invest further in testing,” said Stuart Brown. “We are occupying about eight times our original office and workshop space in the Innovation Centre and it has been a great place to grow the business as the facilities and support are first class. • Pictured above (from left): Ainsley Claxton, who originally joined the Sealpump Engineering team as its first apprentice with Stuart Brown, Julie Thorpe, Stephen Larkin, John Champley and UK Steel Enterprise’s Sue Kirk.